For the month of December, we are planning a pet food and donation drive…and contest! We want to give back to the many local pet charities in our area and a food and donation drive is perfect! This month, if you want to donate any treats or pet food (opened, unopened, canned, dry, you name it), pet clothing your pets no longer wear or don’t fit, toys, unexpired flea/tick/heartworm meds, leashes, collars, even crates they’ve outgrown. Anything you think a dog or cat in need could use, send them our way. 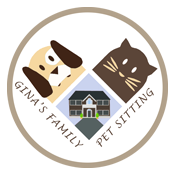 You can leave them in a bag or box labeled for Gina’s Family Pet Sitting and we will get those items to the charities we utilize most. We can pick up during any scheduled service or please message us to arrange a pickup if you have nothing scheduled, especially for any oversized items or heavy bags or boxes. Gina has a direct relationship with all of the above. They are all doing tremendous work in the community and we would love to help them help others! Let’s make it fun–win a $50 PetSmart or Petco gift card!